marta writes: found / stocking stuffers that keep on giving. found / stocking stuffers that keep on giving. saturday night i went out for a bit of a girl night out. yep, just me. it was pretty dreamy. i browsed the shops until close and drank an icy coke and tried on shoes (! ), sans toddler or hubby. once through pottery barn, all decked out, i am officially excited for the holidays. and officially excited about the yards of burlap i bought at wal-mart the other day. tons of burlappy projects abounding in my head for christmas. (i can cut and i can fray. table runner. yes. tree skirt. yes.) but more importantly, my cousin abby (who i was tempting to join me for footloose) reminded me of the fun vintage stocking stuffers at restoration hardware. so i headed there and swooned. 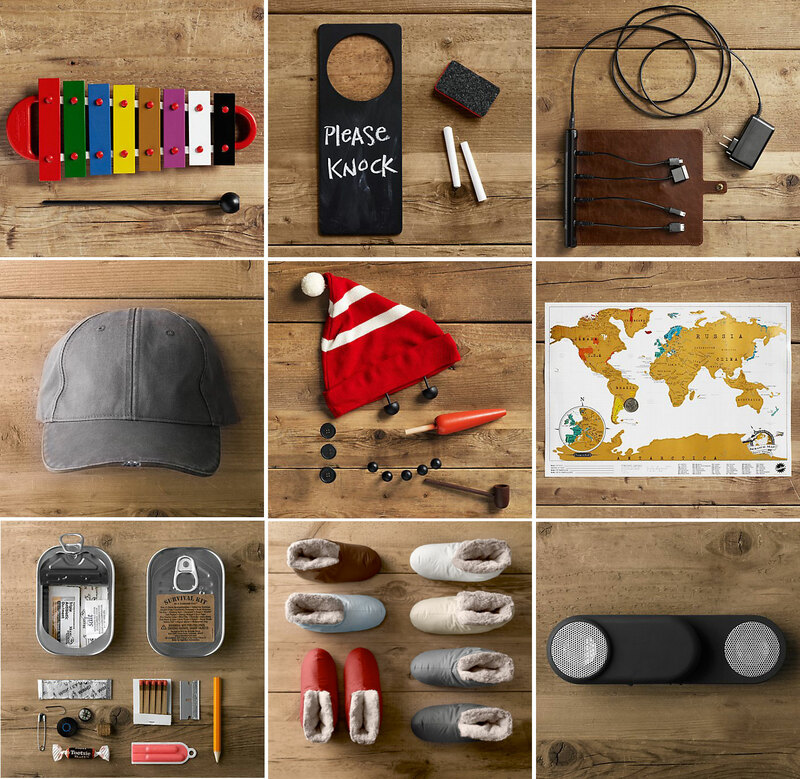 there are a whole slew of good / useful / clever gifts for those hard-to-buy-for people in your life! i love when mini gifts turn out to be the hit of christmas day. here are my faves. left to right / top to bottom. + xylophone. my musical man is going to love this. + chalkboard door hanger / so clever for all ages. + roll up travel charger / genius for your traveling salesman. + gray LED hat / i loved it for its simplicity and then saw the LED lights built into the brim. hooray for your handiman who works in tight spots or likes to tie flies for fishing! + snowman kit / this is totally something my mom would send to the grandchildren. + mini scratch map / i adore this mini version, just right for your favorite explorer. + survival kit in a sardine can / reminds me of something my dad would've made as a kid. i love it. + luxury plush foot duvets (on sale!) / not only do i want these, but i want to give them to every hard working woman i know. seriously, they are so cozy. + go anywhere mp3 speakers / this + an itunes gift card = favorite aunt ever. bonus / if your man is into camping, my husband tells me this is a keeper. Oh wow what I would give for a girl night out! With a 3 month old AND a 20 month old at home I'm dying for one! Loving the stocking stuffers. My hubby usually gets socks and underwear in his stocking, so it would definitely be fun to mix things up this year! I am so in love with those stocking stuffers! I want to share the link, but then I don't want everyone to know what I'm getting them. Conundrum! Cute finds. Love the chalkboard door hanger and the snowman kit. I bought the down foot duvets for myself last week, and they are awesome! this was my favorite place to go in vancouver for holiday inspiration (many a christmas decoration from there!) and stocking stuffers (do they still have the retractable fork that can pinch turkey off of other's plates?) so many a prize was found here in the big glass jars that lite up faces on christmas morning. montreal has no such spot and am struggling now to figure out what to put in the hubby's sock. miss that store big time. I <3 the xylophone! Great ideas! Oh! That snow man kit is darling. It would be the perfect thing to send my nieces/nephew in Seattle. Thanks for sharing!